Classic design and modern trend - are harmonically combined in this Laguiole pocket knife. The exclusive slim and sleek Laguiole knife is a fully hand crafted genuine Laguiole product from the French cutlery manufacturer Claude Dozorme at Thiers. Not only its beautiful decorative damask steel blade makes it unique and individual. Forged from top quality steel and shiny polished, it provides highest cutting comfort with exceptional surface feel and visual appearance. - Purfled with the bee as the typical Laguiole design element. - A pleasure for all senses. 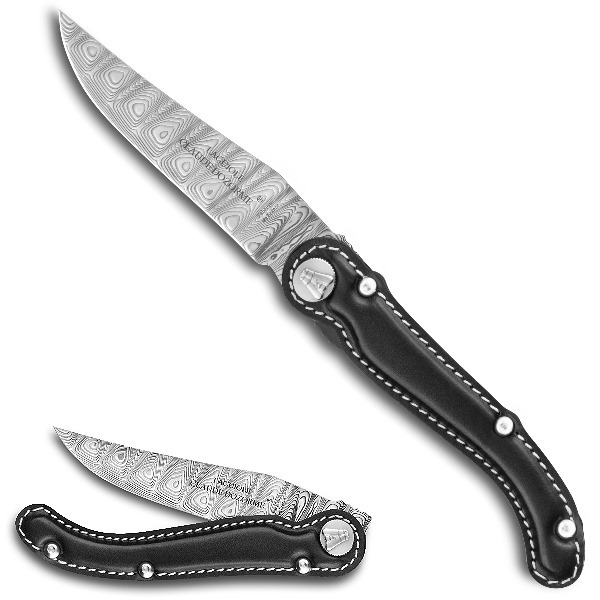 - Laguiole Design-Pocket-Knife with damask steel blade, black leather handle, haft l 12 cm, blade: l 10 cm.